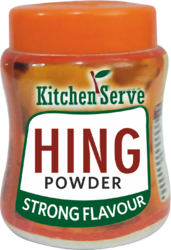 compound hing powder asafoetida is available in pure form in yellow and brown varients used for tadka. it gives authentic flavour and taste to the food and make it delicious. Reckoned amid one of the credible market names, we are willingly betrothed in offering to our patrons Asafoetida Powder. Packaging Size: 10 gm,25 gm,50 gm,100 gm. With vast industrial experience, we are involved in offering a wide range of Asafoetida Powder.These are full of several vital components and are used extensively in cooking.In addition to this, the offered powder is highly pure and fresh. Moreover, our clients can avail this powder from us at moderate prices. The qualitative range of PC-Red Star Asafoetida Powder offered by us is widely demanded for its unmatched flavour. It is formulated using high grade ingredients procured from market trusted vendors. The range is in high demand in the market for flavouring curries, sauces and pickles & is further, offered by us at nominal prices.